We had a couple of hours of great (free) entertainment last night, at Schmidt's Auction and Antiques. This is the best auction house in the area-- and if you have never been to an auction, Schmidt's is a great introduction to the spectacle. Are you afraid that you will end up owning something by accident because you raise an eyebrow or scratch your nose? Check out this link on tips for beginners . We have spent many companionable hours together at auctions, while waiting for our item to come up. Why? It is part drama, part party, and if you're not riveted by the action, it's fine to talk, laugh, read, needlepoint, and people watch. (Unlike a movie). Just try not to wave to anyone during bidding, or raise you hands in the air (like I did, apparently, getting this picture)-- and no, he didn't make me buy the earthenware pitcher that was being sold that moment.... Whew. 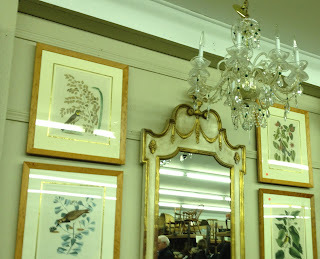 Another nice auction house is DuMouchelles in downtown Detroit. Once you get the bug, you might want to check them out too. The monthly Saturday and Sunday auctions at DuMouchelles are in the afternoon, and they have valet parking. Retired in Ann Arbor: Farmer's Market! !